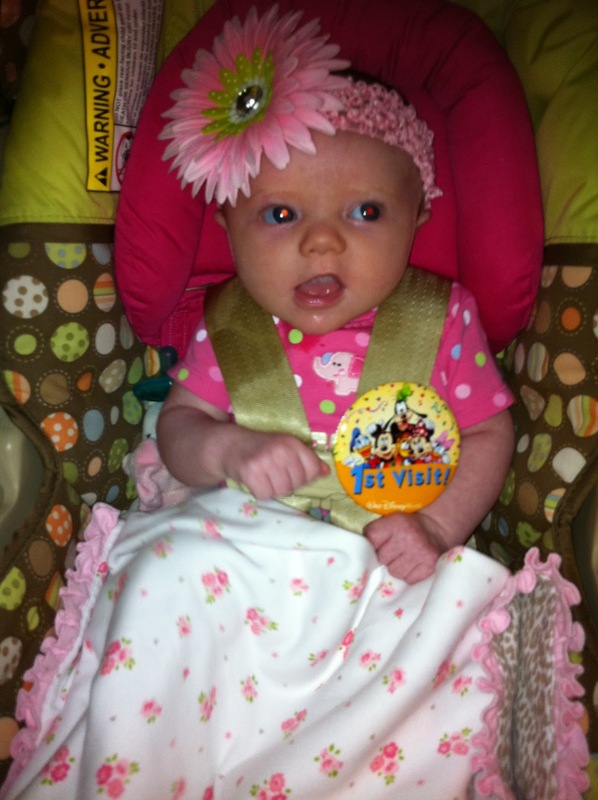 Ella’s First Trip to Disney!! 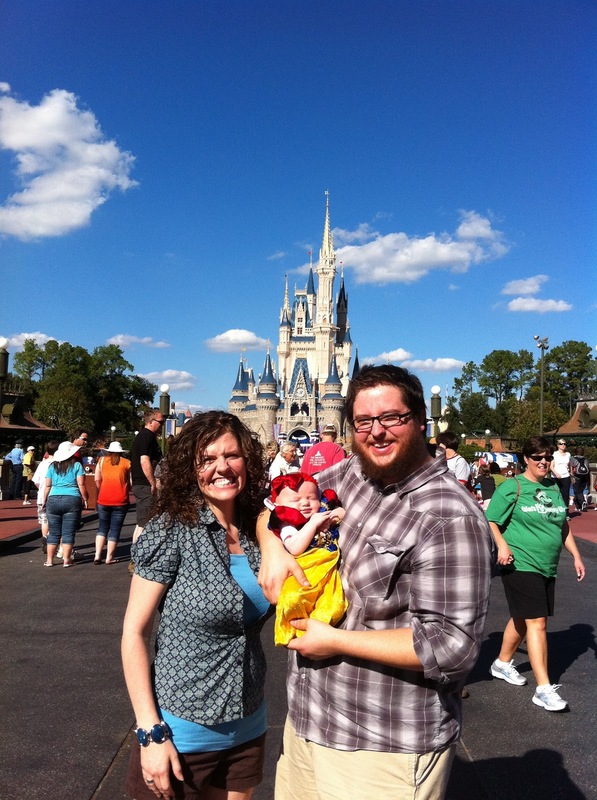 Family Picture in front of Cinderella’s Castle at Disney! Anyone that knows John and I can you tell you how much we love Disney World! Pretty much the whole beginning of our marriage was spent at Disney, haha. We had annual passes and looked at it as a whole bunch of prepaid dates for us. A lot of times we would eat lunch or dinner at home, then get in the car and head to one of the parks for some already-paid-for fun! Also, it kind of became a safe haven for us after the miscarriage. I mean, it’s tough to be sad at Disney World! And, there was most definitely a stretch of time when we didn’t really want to be around many people we knew (well-meaning, but you can only take the “I’m so sorry” looks so many times) and Disney is always packed full of a bunch of people you don’t know! On our Thanksgiving trip to Orlando, we knew from the beginning that we would just have to stop off at Disney. We were both really excited and couldn’t wait to take our sweet baby there! Well, for anyone that’s been to the Magic Kingdom before, you know all about the precious little girls that dress up like their favorite princess (or even get a princess makeover at the park!) and spend the day at Disney walking around all cutesy as can be. I have always told John how if we ever have a little girl, she will most definitely dress up like a princess whenever we go to Disney…and folks, that wish came true! And, the most beautiful part of the whole thing is I thought I would have to wait for Ella to turn 2 years old or so before she’d be big enough to fit in a princess costume. 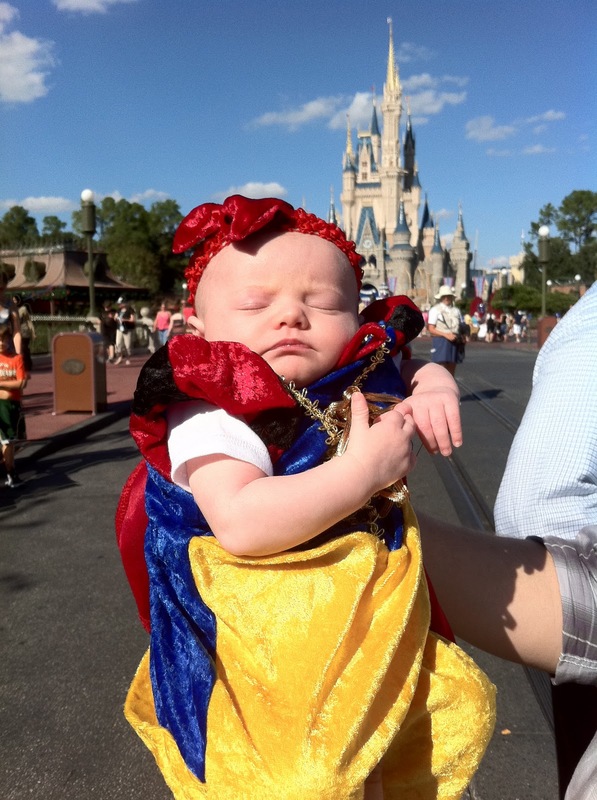 We had never, I mean never, seen a baby dressed up in a princess costume on a regular day at Disney before. We had so much fun that day! I really don’t believe that there are words to describe all of the most amazing memories we made that day. It may seem silly, but soon after we entered the park I got a little teary eyed. There was something redemptive to me about taking my most beautiful baby to the place that her daddy and mommy escaped many a days to try to get through losing their first baby. And, there we were with the most perfect baby that we get to hold! And, there she was, as beautiful as can be with people constantly stopping to comment on her cuteness factor. People were asking to take pictures with her, workers were going around to get other employees to show them Ella, and on and on. Our whole day people did not stop coming up to us or commenting on our little princess. We were not expecting a reaction like that at all! There were a few moments we really thought we were VIP’s or something! Haha! I kept joking with John that we needed to set out a tip jar! Ella did so amazing all day. She barely fussed all day and even got to sneak in a nap here and there. 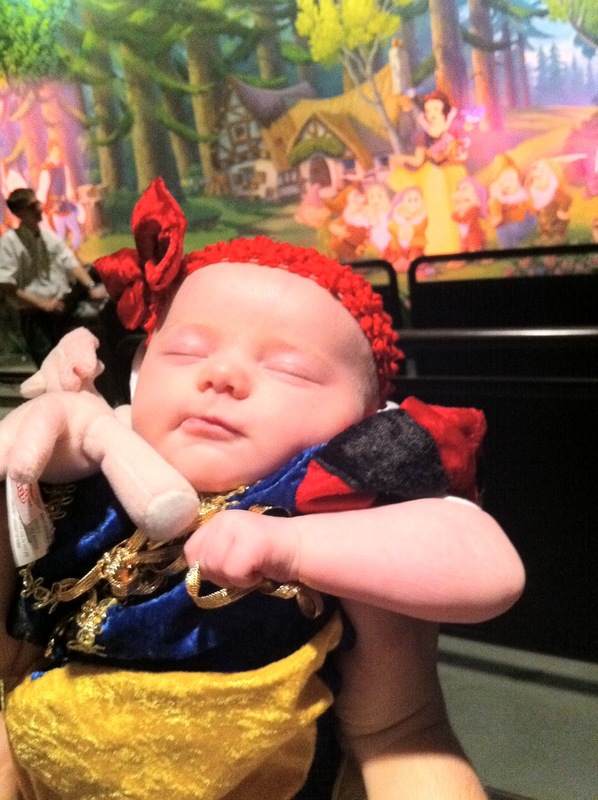 We really couldn’t have asked for a better baby to take to Disney (even when it felt like a million degrees out!). And, little Miss went on her very first ride! Since the Phillips family knows how to stick with a theme, can you guess what it was? 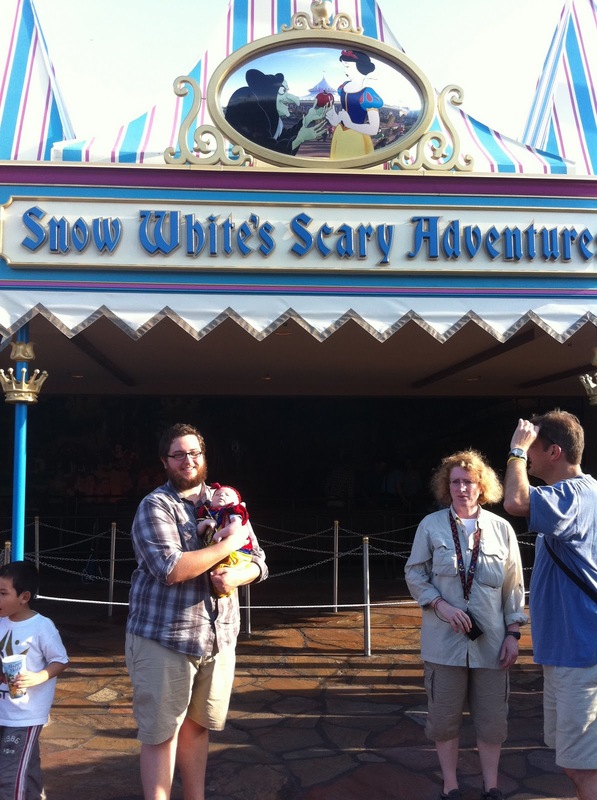 Right before we left the park in the evening, we changed little Miss Snow White out of her costume. We think she looks awfully cute with or without a costume! Ella, what a fun day you had!!!!! 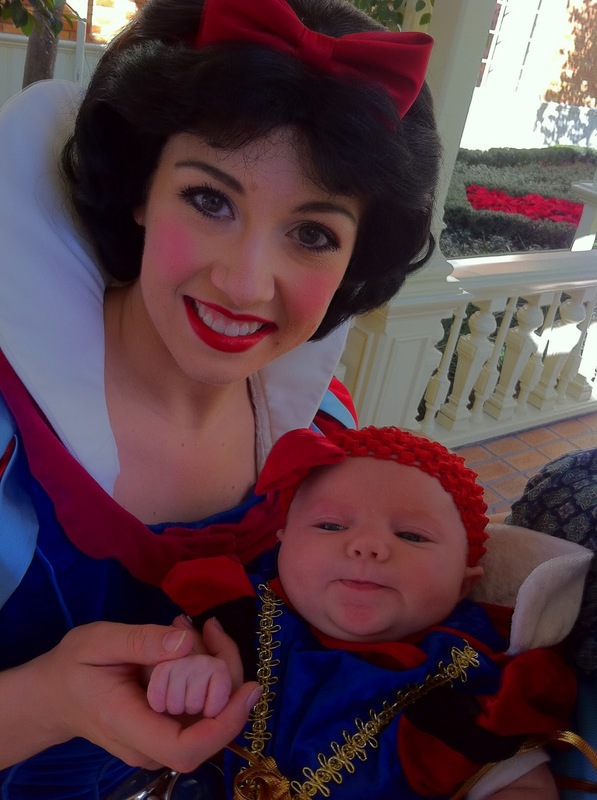 You and the “real” Snow White look so beautiful!!!! Nana and Pop love you soooo much!!! !